Restaurant 101: What does a Runner Do? What does a Runner/ Expediter do? These are the people who make sure that all your food comes out at the same time and in a reasonable manner. This position is one of the most stressful positions in the entire restaurant. This guy is communicates between the kitchen and the front of house staff. In most restaurants, if a server a has a question for the chef, she must go through the expo as the intermediary, not just as a power play, but also to keep the whole thing running smoothly. The pantry station gets the salads, and the fry station gets the French fries. The time stamp and the expediter keep the order coming out on time. Ideally, the expediter tries to make sure that appetizers hit the table within 8-10 minutes of the time the kitchen received the order, entrees should be out within 12-15 minutes. Sometimes, however, if a table has ordered a ribeye well-done, the whole entrée order will wait until the steak is done. No matter what, that course is going to take twenty minutes. I always asked my expos to flag these tables for me when they come up, because twenty minutes can seem like an eternity when you are trying to make conversation with your friend’s new boyfriend and there is no food on the table. So, the expediter keeps the orders coming up smoothly and makes sure that the special orders go to the right tables. Casual restaurants call them runners, fine dining calls them backwaiters, but the position is essentially the same. 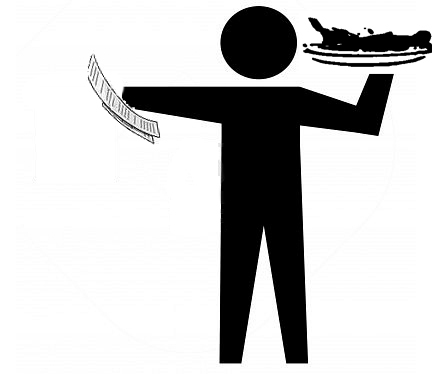 The runner/backwaiter is the person who physically brings the plates to your table. Here’s the deal—the food should never be ‘auctioned’ at the table. EVER. The whole point of service is that the guests in the dining room should enjoy the company of their fellow diners and not be disrupted by the service. Unless the computers have gone down and we are in the middle of an alien invasion, a runner should never ask ‘who had the roughy?’ Remember those position numbers on the expo’s ticket? The Runner bringing out the food should know where the plates go based on those numbers. Most restaurants also place an ‘f’ after the position of any ladies at the table, because ladies are traditionally served first, and because it helps get the food down quickly. It really jacks up the runner if your party changes seats between courses. The runner should place your plates in front of you with his left hand, from your left side. Since most people are right handed, this helps mitigate any interference by gesturing guests knocking plates, etc. Unless a party is seated in such a way that this is not possible (at a booth, or against a wall), in which case the plates should be placed in whatever way is least intrusive. Sidework-wise, the expo and runners set up a garnish station in a steam table or ice bath (depending on whether the item is hot or cold), they clean the expo line, stock additional paper and ribbons for the ticket printers, stock to-go containers, and prepare ramekins of commonly requested side items (ketchup, hot sauce, ranch dressing, sour cream, etc.). In between orders, they typically polish plates, and ensure that the cooks are stocked with the plates that they need for the incoming orders and prod the dishwasher if necessary. Expos and Runners are typically paid minimum wage plus a percentage (usually between 4-8%) of the tips from the servers. A spectacular expo, however, will generally be paid more, up to $14/hr plus a share of tips, because it is such an important position, and a complete nightmare to train a new person to do. Many fast-casual restaurants cut down on the runner/ backwaiter position as the cost of food and labor has increased over the last ten years. Runners in particular, are not revenue generating positions, they can’t sell anything to help offset the cost of their wages. So if the dinner service looks lean, most floor managers will cut the expo and expedite the service themselves, or cut runners and have the servers pick up their own plates. < Previous Restaurant 101: What does a Server do? Thank you very much, I was trying to discover what runner/backwaiter meant and this was great. Please post more about the inner workings! Thanks for reading! I love writing about the inner workings of restaurants, and will try to keep ’em coming. Let me know if there is anything specific you’d like to read about. Thanks this was very helpful. I noticed that I am a little late though 🙂 I just got my first job and they are cross training me to be a hostess and runner. While what you wrote helped me with the runner part, do you think you could help me with both of them? Thanks again. and please don’t hesitate to reach out with any questions! Good luck!